From the moment it was approved in April 1972, America's space shuttle was intended to be a "national launch system" replacing all expendable military and civilian launch vehicles by 1980. It is unlikely that the shuttle would have been built without this goal: the famous Mathematics study "proved" that the shuttle would be economical only if it carried all of America's space traffic . Since a majority of America's space launches have been for military purposes, it was inevitable that the shuttle would require the participation of the US Air Force, the official launch agency for not only the military services, but for American intelligence agencies as well. In exchange for its grumbling support, the Air Force demanded - and got - changes in the design of the vehicle to accommodate its need for improved cross-range and large payloads, among others. For its part, the Air Force was to develop an inertia! upper stage and fund the construction of orbiters 105, 106 and 107 . These "blue" shuttles would have been "dedicated" to classified military missions launched (in some cases) into polar orbits from the re-designed space launch complex six at Vandenberg Air Force Base, flown by crews of military astronauts, and controlled from a custom-built DoD mission control - the Shuttle operations and Planning Center - which would be part of a new complex called the Consolidated Space Operations Center. The Shuttle was the Air Force's third attempt at a manned space programme following the X-20 (1963-64) and the Manned Orbiting Laboratory (1965-69), both of which had been cancelled before flying. However, the decision to "buy into" the shuttle never had total support from all elements of the Air Force, and by the late 1970's, with inflation and a Democratic administration eroding DoD budgets, what Air Force affection there was for the programme began to fade. The new mission control centre, SOPC, was delayed in favour of modifications to the NASA Johnson Space Center and the three additional orbiters were not purchased - a brief attempt to dedicate OV-103 "Discovery" to the DoD failed. Nor would there be a special corps of "blue shuttle" astronauts. Military officers would have to be detailed to NASA as career astronauts in order to fly as pilots or mission specialists. The only opportunity for an Air Force programme seemed to be in NASA's new class of "payload specialists," non-career astronauts whose training would centre on payloads, not the shuttle itself. And so in January 1979, Air Force Under-secretary Hans Mark created a cadre of military payload specialists - people who could explain the Air Force to NASA while explaining the shuttle to the Air Force . A military designation was coined: manned spaceflight engineers. Even though the DoD would ultimately select senior Air Force officials, US Navy oceanographers and Air Weather Service officers as shuttle payload specialists, MSEs would be the first personnel from an American military programme to go into space. This article traces the history of the Manned Space-flight Engineer programme, based on interviews, press reports, published books, and official Air Force documents. Initial responsbility for the definition of the pilot MSE programme fell to Lt. Colonel Robert E. Christian III at Los Angeles Space Division, and his deputy, Capt. Gregory Gillis, both of whom had extensive experience in military space programmes. Christian had also been an Air Force representative at presentations made by Rockwell International concerning manned space programmes as early as 1969. Among their many tasks was the requirement that the MSE be a "tri-service" programme creating a cadre of Air Force, Navy and Army personnel experienced in shuttle operations and the special requirements of military payloads. It was hoped that after tours of duty lasting from four to six years and following flights aboard the shuttle these officers would return to "normal" careers and eventually rise to command positions in the services growing space programmes. Have at least three to ten years' service as an officer on active duty. Rank from first lieutenant to major. Be able to pass a NASA Class III flight physical. Be holder of a bachelor of science degree in engineering, science or space operations, with a master of science in those areas desired. Have a minimum of two years' experience in programme acquisition, test and launch support, of flight and missile operations . Flying backgrounds were not required, though pilot applicants had to have met their first "gates" (minimum requirements for flying time). In addition, of course, applicants had to hold the appropriate security clearance. The initial requirements were intended to recruit a cadre of military space professionals, and in that they succeeded. Vidrine was an engineer with the US Navy Space Project. Higbee, Joseph, Rij, Sefchek, Sundberg, Wright and Watterson were already working on various programmes at Space Division. Payton, the alternate selectee, had been a launch controller at Cape Canaveral in addition to being one of two flight-rated members of the group. Casserino and Detroye had only recently arrived at Space Division from the Satellite Control Facility at Sunnyvale, where they, like Lydon, had been satellite controllers and engineers. Casserino and Detroye had less than three years as officers at the time of selection; Vidrine had served for 15. Detroye was the only MSE without a master's degree, though he had done graduate work. Thus the MSE programme began, with high hopes and great expectations. Maj. Gen. John E. Kulpa, Jr., deputy commander for space operations (DCSO) of the Space Division and one of the programme's biggest supporters, welcomed the men with a speech calling them the "future of the Air Force in space". But problems surfaced even during the first weeks of training. In addition to valuable exposure to shuttle systems at Rockwell International's flight systems laboratory in nearby Downey, California, the original programme relied heavily on a schedule of monthly, week-long visits by the 13 MSEs to various military satellite contractors. This proved to be unworkable and the contractor visits were reduced in favour of vists to other Air Force installations as well as the NASA Johnson and Marshall Space Centers . There were also immediate conflicts with NASA officials, in part because NASA had yet to define its own payload specialist training programme. Early in the MSE programme, the civilian agency had suggested to the Air Force that it would be happy to accept the MSEs at the Johnson Space Center for two years of training, which is just what the Air Force did not want. In the words of one officer: "At that time any Air Force guy who went to NASA never came back!" When the Air Force declined the offer, NASA refused assistance of any kind, taking the position that it had not selected and therefore could not control the MSEs . As late as 1983 one NASA official wrote that he considered MSEs to be engineers and not "flyers", and that they should not partake in any flight training activities until selected as actual payload specialists . Ironically, some MSEs and their managers found themselves frustrated by NASA's excessively-rigid insistence on secrecy. Differences in managerial style and control over flight issues escalated to the point where the more aggressive MSEs found themselves unwelcome at the Johnson Space Center, whose director, Christopher Kraft, was called upon to referee at least one dispute. 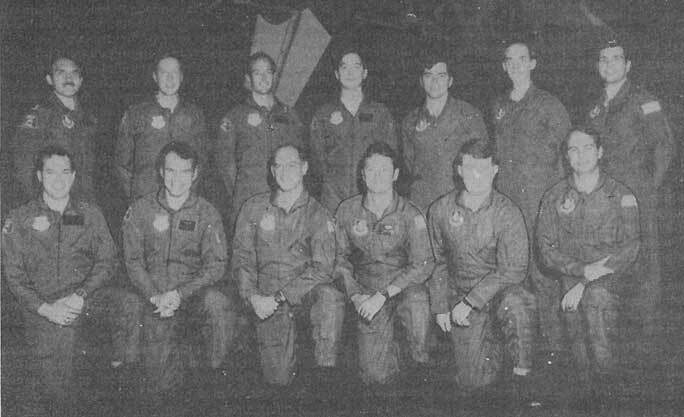 Nevertheless, during the first months of training, members of the first cadre of MSEs had great expectations, having been told that each of them could anticipate flying in space at least once and several of them twice . They took part in underwater EVA and manned manoeuvring unit simulations at NASA Marshall and Martin Marietta, respectively, and went through shuttle mission simulations at Rockwell. Ultimately some members of the group even rode in T-38 jets at Edwards Air Force Base. Such experience gave MSEs greater familiarity with shuttle systems and operations than any other payload specialists and, indeed, many NASA flight controllers (8). In December 1981, the first cadre of MSEs completed training and the experimental programme was officially recognised as the Directorate for Manned Spacecraft Support, Space Division. Lt. Col. Christian retired from the Air Force in October 1981 and was replaced by Lt. Col. David Richardson, who served until the spring of 1983, when Lt. Col. Thomas Redmond became Director, Manned Spaceflight Support. Redmond was replaced in November of that year by the ranking MSE, Cmdr. David Vidrine. By the summer of 1982, it was obvious that more MSEs were needed if the programme was to be adequately represented in Space Division SPOs. Requirements for the second cadre were similarto those of the first, except that this time only USAF officers were to be considered. Announcements were circulated to personnel offices and published in the Air Force Times soliciting applications from officers eager "...to help change military space experiments that now are designed to be controlled from the ground to ones that can be directly manipulated by astronauts in orbit" . The second cadre included two women (Roberts and LaComb) and a black officer (Holder). Backgrounds of the officers, unlike those of the first cadre, did not emphasize space engineering and operations. Odie, for example, had been a bio-environmental researcher at RAF Alconbury in the UK/LaComb and Mantz were primarily computer specialists. Pailes was a rescue pilot now working on microcomputer systems. Puz and Armor had been commanders of Minuteman missile crews. Booen was a weapons engineer. Several of those who had worked on space projects had only two or three years' experience and they were also, on the average, younger than the first cadre. More significantly, the new selectees were told that only half of them might fly in space. It was as if the first cadre were pathfinders -pioneers - and the second cadre were homesteaders. Training for the 14 new officers was similar to that of the first 13, though more organised, and "graduation" took place in January 1984, when they, too, were assigned to Space Division SPOs. During 1984 there was some attrition: Commander Vidrine retired in October and one officer was dropped from the programme. MSEs gained their first mission experience working with astronauts T. K. Mattingly and Henry Hartsfield, the crew of STS-4, the last shuttle orbital test flight, which carried the P-80-1 experiment package. MSEs Sefchek and Watterson worked on the payload while Casserino, Detroye and Payton acted as "paycoms" (payload communicators) at the Air Force Satellite Control Facility in Sunnyvale, California. The best known of the "secret" experiments, a sensor known as CIRRUS, failed to operate as planned . Just prior to STS-4, in June 1982 the first payload specialist selection board named seven MSEs as prime or backup candidates for three different shuttle missions scheduled for 1983 and 1984: STS-10 (Payton/Wright), STS-15 (Detroye/Sundberg/Watterson) and STS-16 (Casserino/Joseph). Reported payloads included a TRW/Defense Support Programme early warning satellite as well as two intelligence satellites, some of which were designed to be boosted into geosynchronous orbit by the Boeing inertial upper stage following release from the shuttle. The military payload specialists would observe satellite deployments and IUS firings, and operate scientific experiments . On April 4,1983 during deployment of the first Tracking and Data Relay Satellite from STS-6, the IDS suffered a failure which had serious repercussions on the MSE programme, forcing massive changes in the military payload manifest: STS-10 was immediately cancelled, followed in February 1984 by STS-15 (then designated Mission 41-E) and in April 1984 by STS-16 (Mission 41-H). In fact, the STS-10 payload, widely reported to be a TRW/National Security Agency ELINT satellite called Magnum, was configured only for shuttle launch with IDS and could not be cancelled - it had to be slipped from one shuttle IDS slot to another. Published reports have stated that the original STS-15/Mission 41E and STS-16/Mission 41H payloads were dualconfigured for shuttle or Titan and simply shifted from one system to the other - the 15/41E for a January 1984 Titan, the 16/41 H to one launched in December 1984 [131. Other sources indicate, however, that 15/41E was simply cancelled while 16/41H was postponed indefinitely. In any case, because of Magnum's importance, the DoD exercised its "launch on demand" option, preempting the next shuttle/IUS spot on the manifest. Mission 51 C, which was intended to launch the civilian TDRS-B. TDRS-B was moved to Mission 51 E.
The second MSE selection board, in the summer of 1983, confirmed the assignment of Maj. Gary Payton as prime PS and Maj. Keith Wright as backup PS for what was then STS-15. It also named Capt. Frank Casserino as prime PS with Maj. Daryl Joseph as backup for STS-16. At this time there was a brief and unsuccessful attempt to place MSEs on "civilian" shuttle missions for which DoD was contributing funds. Commander Vidrine became a candidate for PS "observer" on STS-13/Mission 41C, the Solar Maximum Mission rescue, and even went through flight simulations with the astronaut crew corn-manned by Capt. Robert L. Crippen (USN). In March 1984, however, one month before scheduled launch, Maj. Gen. Kulpa's successor as Space Division DCSO, Maj. Gen. Ralph G. Jacobson, refused to authorise Vidrine's flight, claiming it had "no value" to the Air Force, and pulled him from the crew. A year earlier, in March 1983, Jacobson had summoned Christian and the first cadre MSEs to his office for what came to be known as "the Saturday Morning Massacre". Jacobson was concerned about shuttle launch delays and wanted the MSEs to understand that his mission, i.e., the launch of national security payloads, dwarfed their mission, flights in space by Air Force personnel. It should be noted that the DoD always intended to choose shuttle payload specialists from other services and commands. Civilian "Navy oceanographers Paul Scully-Power and Robert Stevenson were selected in early 1984; Scully-Power went into space that October aboard Mission 41G in place of Stevenson, the original first choice. Stevenson was re-manifested for a series of shuttle missions beginning with STS-15 and was finally assigned to Mission 61K, scheduled for 1986, only to see it cancelled following the "Challenger" disaster. In late 1985 three officers from the Air Weather Service were selected for another 1986 shuttle flight, the Weather Officer in Space Experiment (WOSE). The Navy also intended to fly a command, control and communications specialist in 1987. These were in addition to MSE and "dignitary" payload specialists such as Air Force Undersecretary Edward Aldridge and Gen. Lawrence Skantze of the USAF Systems Command. The Vidrine incident was just one sign of the continuing struggle within the Air Force over the value of the shuttle versus expendable launch vehicles. Hans Mark and Maj. Gen. Kulpa had championed military man-in-space activities, but their successors, notably Edward "Pete" Aldridge, were doubtful that the shuttle would ever be reliable enough for operational military needs . Aldridge successfully fought for the purchase of 10 additional Titan expendable launch vehicles in 1985 and saw his judgement vindicated when the shuttle "Challenger" exploded, grounding the programme for a lengthy spell. Even among Air Force space proponents, opinion on the shuttle was sharply divided. Some officers had a clear vision of its usefulness for military activities while others scorned it as a fragile research vehicle. The shuttle also suffered from the "not invented here" stigma . The MSE programme provided a focus for this debate, becoming, in the words of one MSE, "grist". Some senior Space Division officers supported the programme while others did not. Cadre commanders, notably Col. Mart H. Bushnell (who succeeded Vidrine in 1984), lobbied unsuccessfully for additional officers and for SD support with NASA, which had the already noted reservations about the MSEs . In 1983 there was an attempt to give the MSE programme more clout inside the Air Force and NASA with a single stroke when Space Division officials asked astronaut John Fabian, a USAF colonel detached to NASA and veteran of STS-7, if he would consider returning to Space Division to head the group, but Fabian declined . The low point of MSE morale was probably the last months of 1984. In October, the third selection board named Maj. Brett Watterson and Capt. Randy Odle as prime payload specialists and Capt. Michael Mantz as backup for shuttle Mission 62A, the first Vandenberg-launched orbital flight test. Also named were Capts. William Pailes (prime) and Michael Booen (backup) for another DoD launch-onneed payload scheduled to be launched in the autumn of 1985. But no one knew for certain just when these missions would be flown. The Payton/ Wright and Casserino/Joseph teams were still on the ground and at least three other payload specialist slots had been permanently lost. Selection of eight or nine new officers for a 1985 third cadre was halted. Worse yet, Air Force Secretary Vernbe Orr issued a policy statement designed to eliminate "homesteading" - that is, USAF officers should spend no more than four years at one particular station. Officers remaining in one place for greater lengths of time would be penalised when promotions were made. By this time, of course, all MSEs had been at Space Division for at least four years. Some officers, like Watterson and Sefchek, had spent as many as eight years at SD. 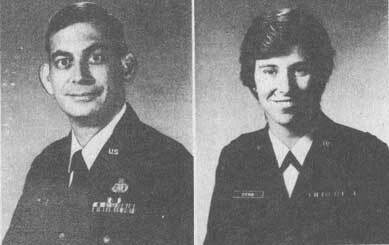 Those MSEs without flight assignments immediately made plans to look for other work, and by the summer of 1985, all but Watterson, Casserino and Sefchek had transferred. Finally, on January 24, 1985, MSE Gary Payton went into space aboard the Discovery on Mission 51C. Nine months later, second cadre MSE Pailes was aboard the first flight of the shuttle Atlantis on Mission 51J. Just three weeks prior to 51J, in September 1985, Space Division announced publicly that MSE Watterson would fly aboard shuttle mission 62A, the first manned launch from Van-denberg AFB . This was a break in procedure, since Payton and Pailes had only been identified at launch-minus-30 days . The crew of the first DoD dedicated shuttle mission, STS 51-C. (Kneeling right) Thomas Mattingly, commander, and (kneeling left) Loren Shriver, pilot, (standing left to right) Gary Payton, Manned Space Flight Engineer, James Buchli and Ellison Onizuka, mission specialists. The crew that never flew. Mission STS 62-A was to have been the first shuttle flight from Vandenberg Air'Force Base. The flight was cancelled following the Challenger Accident. (Front row, left to right) pilot Guy Gardner and mission specialists Richard Mullane, Jerry Rocs and Dale Gardner. 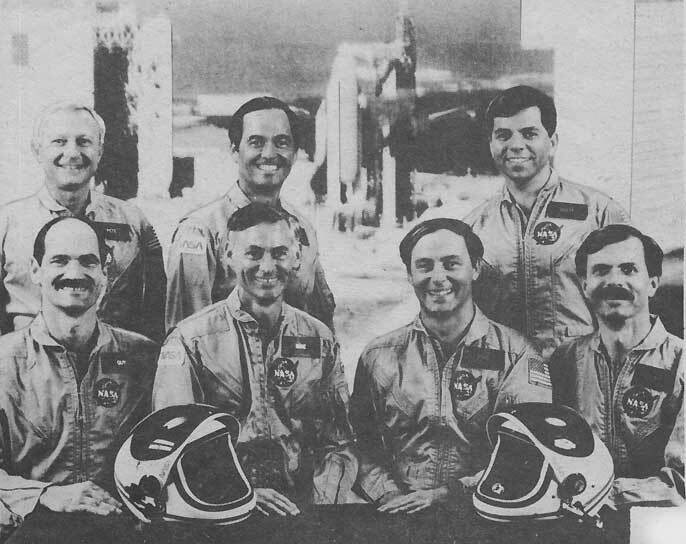 (Back row left to right) Air Force Undersecretary Edward Aldridge, commander Robert Crippen and Manned Space Flight Engineer Brett Watterson. This list does not include Lt. Col. Payton or Maj. Watterson, who had been publicly identified, or Capt. Casserino, who had not, because these officers were still assigned to Special Projects. They were not formally associated with the MSE programme, though they remained eligible for assignment to shuttle crews. Second cadre officers Armor, Holder, Roberts and Thompson were also assigned to SP. The question of publicity in itself mirrors the debate over the value of the MSE programme. Officers selected for the first cadre in 1979 were, in some cases, identified through the Pentagon's hometown press service and not instructed to keep their new assignment secret. Maj. Payton's biography, identifying him as a manned spaceflight engineer, was published in Janes' Who's Who in Aerospace and Aviation in 1984. The new MSEs were under the impression that the Air Force, as it had with the X-20 and MOL pilots, was going to publicise their existence. "An announcement was to be made 'any day now"", one of them says, "but that day never came". Apparently some men sent out the news with their' Christmas cards in December 1979, only to be told to recall them. Existence of the group (which was originally organised as a Special Project) remained secret, by and large, until late 1982, when various publications ranging from the Houston Postto Aviation Week disclosed the fact that a "secret cadre" of 13 officers was training as shuttle payload specialists. The Aviation Week story appeared as NASA named an astronaut crew commanded by Navy Capt. T.K. Mattingly to STS-10, then scheduled for launch in November 1983. MSEs Payton and Wright also began to train with astronauts Mattingly, Shriver, Onizuka and Buchli, a fact which was surely known to hundreds of civilian employees of the NASA Johnson Space Center. MSE Pailes, who found himself frozen out of certain crew functions and forced to invent cover stories to explain his presence at JSC, would later propose a change in security policies to allow for disclosure of the MSE gt the same time the NASA crew was announced . In May 1983 Space Division issued a press release confirming the existence of the MSE group and stating that 27 officers had been trained. It was rumoured that SD was now willing to provide pictures and biographies of the MSEs, but, again, no release was made and queries were met with silence (MSE biographies eventually obtained by the author some years later were all dated May 1983). One MSE suggests that publicity for the group would have implied a greater level of Air Force support for the programme than actually existed. In any case, it was not until reports appeared in the press concerning the Pentagon's secret cadre of "soldier-astronauts"  that official clarifications were made. By November 1985, experience with two successful DoD-dedicated shuttle missions had allowed the Air Fdrce and NASA to reach mutual agreement on dealings concerning security, manifesting and other issues. In addition to the oft-delayed Vandenberg Orbital Flight Test, Mission 62A, five other dedicated missions were scheduled to be flown up to May 1987. The first two launches of Navstar GPS satellites were also scheduled. The fourth MSE selection board met that month and assigned five officers as prime payload specialists for the six new flights: Casserino, James, Jones, Roberts and Puz. Capt. Larry James would make two flights with Navstar. Plans for the selection of a third cadre, cancelled in 1984, went ahead. It appeared that the MSE programme was about to be vindicated. Then, on January 28,1986, the shuttle "Challenger" exploded during launch. During the spring of 1986, as the American space programme suffered through a seige of failures and reappraisal, Air Force space managers decreed that MSEs would no longer accompany certain payloads on shuttle launches. This list included TRW Defense Support Program satellites in addition to the previously-mentioned DSCS and Navstar GPS payloads. The primary reason cited was concern for safety. MSEs would continue to train for flights with selected national security payloads, with the Strategic Defense Initiative's "Starlab" (variously known as the Tracking and Pointing Exercise or TPE, PATIE, and Blue Spacelab) and with DoD scientific experiment packages. 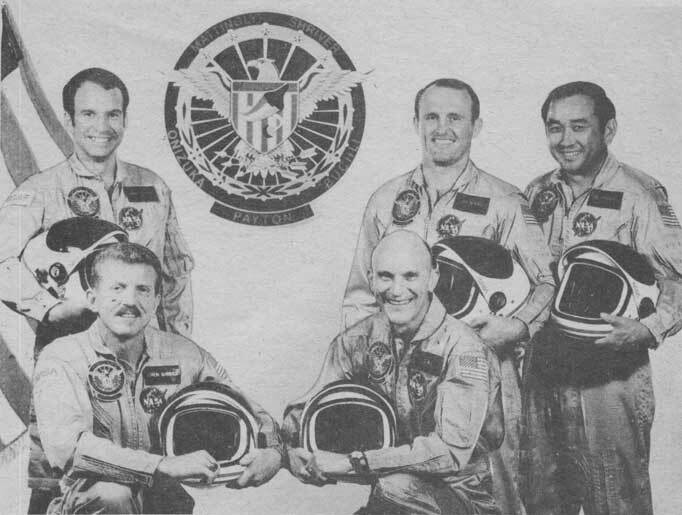 Four of the new officers had operational space backgrounds - Carretto and Stevens had worked as shuttle flight conti oilers with the 1st Manned Spaceflight Support Group at the NASA Johnson Space Center while Staib had been an IUS controller at Cape Canaveral and DeArmond a satellite control officer at Sunnyvale. Crombie was a flight test engineer. They completed training in January 1987. The revised shuttle programme manifest issued in late 1986 called for five dedicated DoD missions in the first year of resumed operations, presumably providing opportunities for flights by several MSEs. Yet just four weeks later, NASA Administrator James Fletcher announced that the first five shuttle missions, including two DoD flights, would be flown by five-member NASA astronaut crews only. Fletcher further expressed the desire to keep PSs of all kinds off shuttle flights for the next 20 missions, "... if not forever" . At the same time, the NASA astronaut office was lobbying for the elimination of payload specialists, with the possible exception of Spacelab-type missions, on which a single PS would be included. 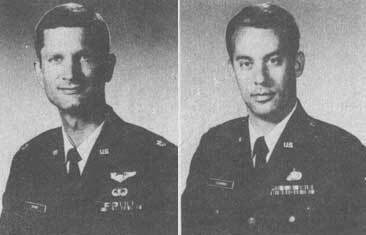 Nevertheless, in April 1987 a new payload specialist selection board named Maj. Craig Puz and Capt. Maureen LaComb as prime payload specialists for the StarLab mission scheduled for 1989 or 1990, a decision which was announced publicly in October. Later in 1987 Space Division finalised plans to send two MSEs into space with a payload consisting of the long-delayed AFP 888 Teal Ruby satellite, the AFP 675 Cirrus 1 A package, and the Infrared Background Signature Purvey (IBSS) camera. The crew of the second DoD dedicated shuttle mission STS 51-J. 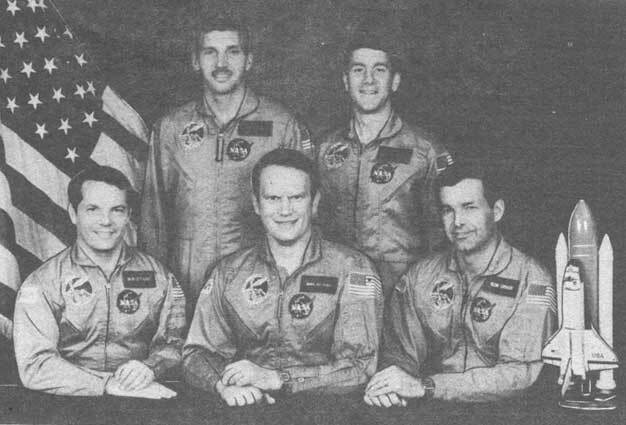 (Front centre) Karol Bobko, commander, (front right) Ron Grabe, pilot, (rear left) William Pailes, Manned Space Flight Engineer, (rear right) David Hilmers and (front left) Robert Stewart, mission specialists. In spite of the existence of a handful of flight opportunities, by the end of 1987 the MSE programme had been allowed to wither. Cadre director Pailes returned to Operational "flying as a rescue pilot at Eglin AFB, Florida, and was not replaced. Following the additional transfers of MSEs Booen, Jones, Mantz and Roberts to other Air Force assignments, and resignations by MSEs assigned to Special Projects, the group consisted of ten officers. No further selections were planned. And it is far from certain that members of the existing group will go into space even on the Starlab or IBSS missions. For example, the SDI organisation plans to assign its own personnel as Starlab backup payload specialists. Further, in late 1987 the US Air Force conducted a new study of "military man-in-space", intended "to settle a 25-year Defense Dept. debate about the relative usefulness of manned versus unmanned systems..." . Of the 11 scheduled "exercises", a majority would require flights by personnel from the Air Weather Service, the US Navy and the US Army, not the MSE group at Space Division, even though MSEs were to integrate the tests. One official speculates that, ultimately, "Payton and Pailes will be the only MSEs to fly". The author wishes to acknowledge the assistance of the former and current members of the MSE programme who took the time to review and correct certain portions of this paper. Any remaining errors are the author's. It should be noted that information concerning military shuttle payloads comes from open literature identified in the notes. 1. For an analysis of the original shuttle design and goals and the Mathematica study, see Enterprise by Jerry Grey (New York: Wm. Morrow & Co., 1979), pages 72 through 79 in particular. 2. For a discussion of the relationship between NASA and the Air Force, see Prescription for Disaster by Joseph Trento with Susan Trento (New York: Crown, 1986), p. 122-149. 3. Mark, a former (and future) NASA official, was one of the Air Force's few shuttle supporters. As Undersecretary of the Air Force he was responsible for all military space programmes, including secret "Special Projects" in his "black hat" role as head of the National Reconnaissance Office. 4. For a more detailed description of the MSE program and training, see Spacefarers of the Eighties and Nineties by Alcestis Oberg (New York: Columbia University Press, 1985). 5. NASA Official Jay Honeycutt did advise the MSE selection board. 6. Memorandum from Gerald D. Griffin, Director National Space Transporation Systems Programme Office, NASA, to Manager, NSTS. August 22,1983. 7. The March 1982 NASA Space Transportation System manifest baseline predicted eleven dedicated Dob missions between June 1982 and September 1985. 8. From time to time, USAF space managers considered the idea that manned spaceflight engineer training should be prerequisite for all Air Force mission specialist astronaut candidates. This idea never received strong support, but several MSEs have been submitted to NASA as potential astronauts: James Armor, Daryl Joseph, William Pailes, and Gary Payton were nominated in 1985; Pailes and Maureen LaComb in 1986 (the suspended selection) and again in 1987. Pailes was a finalist for the 1987 mission specialist group. 10. Air Force Times "Officers Needed to Redesign Space 'Control' Experiments," May 24,1982. 11. For a description of the STS-4 payload, see Aviation Week, June 4, 1982. 12. It has been rumoured incorrectly that some MSEs would have performed EVA. While it is true that member of the group were trained in EVA procedures, including use of the manned manoeuvring unit, US Code presently allows EVAs only by NASA mission specialists and pilots. 13. Aviation Week, February 13,1984. See also Anthony Kenden, "US Military Activities in Space - 1984", privately published, 1985. 15. There was a virtual repeat of the Vidrine mcident later in 1984, when NASA offered Space Division the opportunity to add a second payload specialist to the crew of Mission 51 C. SD officials declined. 16. In early 1985 SD officials requested a seat for a payload specialist MSE (Capt. Scott Yeakel) on Shuttle Mission 51G, then scheduled for June of that year, to operate the MARC-DN camera. NASA refused, claiming that payload specialists with "higher priority" were already manifested. This elicited a stinging responselfrom SD, since oneof PSs was Saudi Prince Sultan Salman al-Saud, a professional broadcaster whose function was strictly that of an observer. The issue became moot when other payload manifesting problems delayed the flight of the MARC-DN to Mission 51 J, a dedicated DoD flight, where it was operated by MSE William Pailes. 17. Ironically, when Fabian finally left NASA in January 1986 he became director of space for the Air Force at the Pentagon, where he supervised the development of military satellites. Trento, p.6, claims this was a Special Projects (National Reconnaissance Office) job, but Fabian reported to the director of research and development, not space systems and C3. The latter job is in the usual NRO chain of command. 18. Watterson's fellow payload specialist was to be none other than Air Force Undersecretary Pete Aldridge, Hans Mark's successor, who had assigned himself to the crew, bumping MSE Captain Randy Odie. As early as 1983, General Lawrence Skantze, commander of the Air Force Systems Command, had also requested^ flight aboard the shuttle and was in the process of being manifested for a 1986 shuttle flight at the time of the "Challenger" disaster. 19. Craig Covault, "Military to Withhold Shuttle Lift-off Time", Aviation Week, November 9,1984, p. 14. This article also discusses security procedures for military shuttle missions and the "classification" of the Mission 51 C crew patch because it contained Payton's name. 20. "51J Postflight Report: Some Lessons Learned", William Pailes, October 1985. 21. For example, "Space-War Era: It's Already Here", US News and World Report. December 17, 1984, p.28. 22. Quitted in USA Today, January 29, 1987. 23. Craig Covault, "USAF Plans Military Exercises on Space Shuttle". Aviation Week. January 4, 1988.